For 2016, the Nissan GT-R is available in a limited 45th Anniversary Gold Edition that is based on the Premium trim and includes a special paint color, a special gold-tone VIN plate inside the engine compartment and a special commemorative plaque on the interior center console. Premium trims now feature new 20-spoke RAYS aluminum-alloy forged wheels. 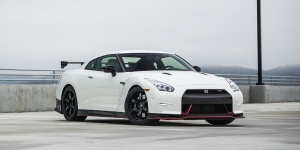 Find the used Nissan GT-R of your choice from a dealer in your area. Search our used car listings now.